Quality and value combine to make this our best seller. Features large volume refill. 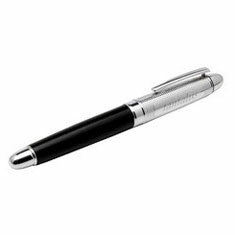 Available in matt black, matt navy, satin chrome or gloss white, all with silver trim. 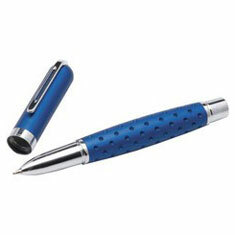 An up-market contemporary style pen. Features large volume refill. 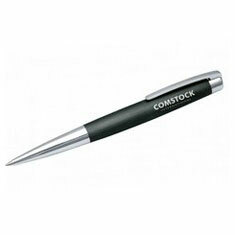 Crafted from Aluminium, this stylish pen features a hairline finish and spring-loaded clip. Features a large volume refill. Simplicity in design combined with quality construction. Featuring a spring-loaded clip for added longevity. Available in matt silver or matt grey. Features large volume refill. 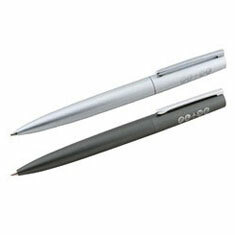 This fine writing instrument with leather and chrome finish will make a mark for its quality and style. Optional packaging available. RUNOUT STOCK. 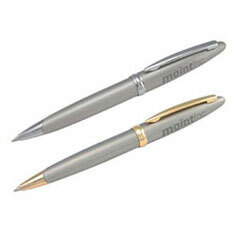 A beautifully-crafted metal pen; with a spring-loaded clip; that will provide years of writing enjoyment. 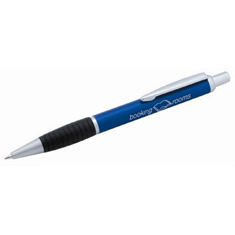 Available in metallic blue or metallic grey. Optional packaging available. RUNOUT STOCK. 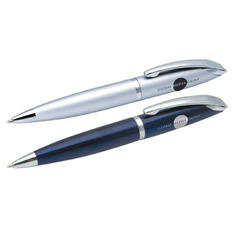 An upmarket metal pen with a modern design makes this a great executive gift. 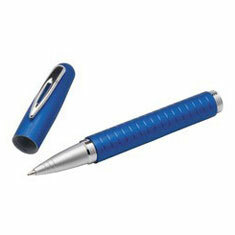 Available in metallic blue. Optional packaging available. Combining an aluminium barrel with ridged rubber grip. 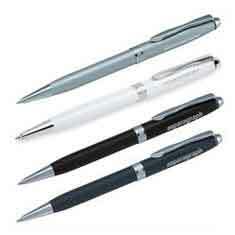 Available in matt black, matt silver or matt blue, all with matt silver trim. Features large volume refill. High-tech in appearance with aluminium construction. 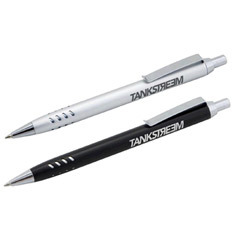 Available in black or silver, both with silver trim. Features large volume refill. 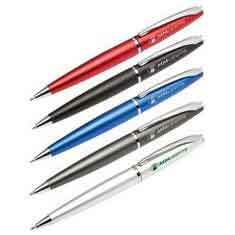 With an Aluminium barrel and diamond patterned grip, this stylish pen is in a class of its own. 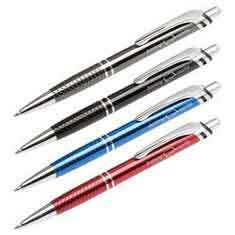 Available in black, gun-metal, blue or red all with gloss chrome trim.